Self-proclaimed prophet Shepherd Bushiri and his wife were arrested by the Hawks on Friday morning in Rustenburg on charges of fraud and money laundering. Hawks spokesperson Hangwani Mulaudzi confirmed the arrest and said the case against the couple was linked to alleged offences of fraud and money laundering, as well as the contravention of the Prevention of Organised Crime Act (POCA), which had been committed from 2015. The contravention of the Act was in relation to Exchange Control Regulations relating to foreign currency of $1 147 200 (around R15m). Mulaudzi said that the couple, who run several business enterprises in South Africa and abroad, were expected to appear before the Pretoria Commercial Crime Court on Monday. According to a statement posted on Bushiri’s Facebook page, the arrest took place at 07:00 at the Sparkling Waters Hotel in Rustenburg. “They took the Prophet and our mother Prophetess Mary Bushiri in handcuffs to Pretoria. They have charged our father with fraud and money laundering,” the statement on his page reads. Earlier on Friday, the CRL Commission exonerated Bushiri from responsibility for the stampede at his Pretoria church, where three people died, saying the church had fully complied with safety regulations. 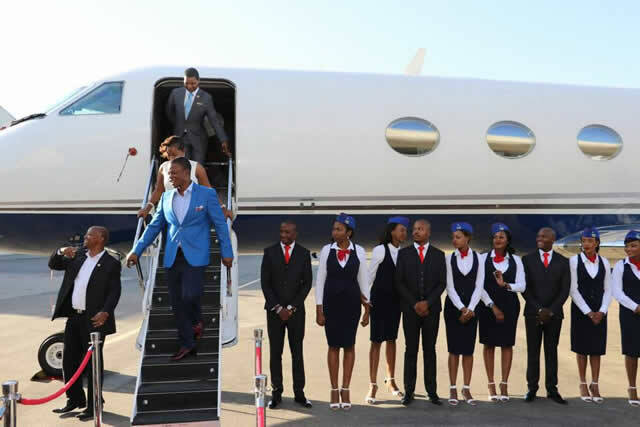 In April last year, tabloid publication Sunday World reported that Bushiri was apparently making so much money from his churches in South Africa that he was able to send R15m a month back to his home in Malawi. Mulaudzi confirmed to the tabloid at the time that the Hawks had been investigating the pastor, but cautioned that the case was in its early stages and that he could not divulge or confirm any details. The controversial prophet at that time told SABC News that he was not even aware that the police were investigating him and that he had only heard about the investigation through the media. The “Major 1” as he is affectionately known by his followers, also kept social media abuzz in December 2017 for selling tables for a gala dinner at a cost of between R1 000 and R25 000. Social media users found these prices ridiculously high and have taken to Facebook and Twitter to share their thoughts. Bushiri has recently denied that his church demanded congregants to pay in order to have one-on-one sessions with him. HK is finished. No wonder he can’t afford to defend his seat. Finito!!!! Why do we have news about losers!!!! How can you people call that sellout Bushiri as “father” and that wife as “mother”. Those kids need just come back to Chimwemwe in Zambia where they grew up. I read in another publication where PF where calling Ba Ester as “…their mother of nation”. Your mother with 25 domestic workers to America, that is fraud and money laundering. I guess Prophets don’t see their own doom. Start withdrawing your Tithe, ye gullibles. These boys are businessmen but crooks who will cut corners …isn’t this the boy who moved dead bodies to the mortuary when his church’s roof collapsed thus tampering with a crime scene. Unfortunately these boys have a limitless supply of docile African foooools happy to fund his tax-free lifestyle with tithes. You shall know them by their fruits. This man is a crook it’s amazing how many people are deceived by him and the other prophets like him .READ YOUR BIBLES its all in there-there is no need for people to get hoodwinked by these flashy prophets. Fo o l i s h African Followers of F A K E Prophets how long do u need to understand that pompwe Prophets are using you to Buy Private Jets. Among these prophets, Who isn’t SELF PROCLAIMED? I totally agree with you. These are blind guides with multitudes of blind followers. We only ask our Lord Jesus Christ to open their spiritual eyes so that they awake from the slumber. And for as long as the Lord lives these con artist won’t keep God’ children in slavery forever. Their wages fast approaching, weighed and counted according to their sins! Harry Kalaba, we warned you bwana not to insult President Lungu and the PF by purporting falsehood because a fake prophet had swindled you and “revealed” the impossible that you can be the next president of Zambia. Now you have joined bandwagon of Satanists of the likes of HH. Muletekanya imwe bamumbwe, to lead a nation is not a self imposed or proclaimed thing but a serious mandate that only comes from people who are able to see through your lies. Harry Kalaba’s prophet lol. Jehovah is our only heavenly father in Jesus’s name. Follow Jesus and the bible entirely. Also work hard and save. my sister’s and girlfriends prophet! I FAIL PITY ON FOLLOWERS..
Let God take control… And live everything in the hands of God. That is why I support Paul kigame , even through his dictatorial tendencies…..he does not let theives like these rip off his people…..
How can this young crook be called a prophet?amazing stuff.WHAT NEXT NOW BO HARRY KALABA?You shall learn it a harsh way like Miles Sampa did in 2016!! !Politics teyabana iyo!!! BUSHIRI’S ARREST IN SA MARKS THE END OF HARRY KALABA’S POLITICAL CAREER!! The wind is blowing.Lets just watch and see. This is the guy who prophesied Kalaba would be president. When GRZ barred him from entering Zambia, as usual was that same old cry HUMAN RIGHTS. Good thing about RSA their politics are free of bitterness. ….bitterness makes you oppose even the good things as long as government is involved. What a prophet!!! he even failed to sense that he was being investigated but only read about it in the media…lol..but Jesus Christ knew that he was going to be betrayed by Judas…. So this crook has even blind followers..God help us!!! He did not even smell the coffee and his socalled followers listen to him as a prophet. A prophet who cannot sense his own arrest and wants to champion the destiny of others. This guy is a real crook. Just watch on youtube some of his lousy tricks just to get more money from his followers. This is a hypocritical view.SO WHAT IS DIFFERENCE IN Bushiri and the three church mother bodies? Sin is doing WRONG THINGS DELIBERATELY. Fortunately he is not a crook but a powerful prophet. We love him. As a follower we know that these things would be coming because The prophet himself prophesied about his persecutions. However the devil is just shooting himself in the legs just like in the book of Act 12 Herod arrested Peter so that he kill him. The story ended in Mr Herod dying and the worms ate him. May God bless our prophet Bushiri & the wife. THE CULT LEADER SHEPHERD BUSHIRI WHO IS ARRESTED WITH HIS WIFE FOR FRAUD & MONEY LAUNDERING is not a prophet but a con-artist! IT JUST A WIND BROTHREN OUR MAJOR 1 PROPHET WITH MUM WILL COME OUT IN JESUS NAME. IF THEY WANT LET THEM GO AND ASK Mr HEROD IN ACT 12 HOW HE DIED TERRIBLY AND HOW HIS SOLDIERS WERE DEFEATED BY GOD INCLUDING THEIR HUNDCAFFS AND IRON DOOR BROKE OWN THEIR OWN. ALL THOSE WHO ARE LAUGHING NOW ARE JUST BEING USED BY THE DEVIL. IF GO IS FOR US WHO CAN BE AGAINST US??? COMPLETELY NOBODY. IT JUST A WIND BROTHREN OUR MAJOR 1 PROPHET WITH MUM WILL COME OUT IN JESUS NAME. IF THEY WANT LET THEM GO AND ASK Mr HEROD IN ACT 12 HOW HE DIED TERRIBLY AND HOW HIS SOLDIERS WERE DEFEATED BY GOD INCLUDING THEIR HUNDCAFFS AND IRON DOOR BROKE OWN THEIR OWN. ALL THOSE WHO ARE LAUGHING NOW ARE JUST BEING USED BY THE DEVIL. IF GOD IS FOR US WHO CAN BE AGAINST US??? COMPLETELY NOBODY. Of course they were involved in money laundering. That’s what most of these pastors do with their churches. Some of them are fronts for politicians and drug barons. There’s no way this stuntman wasn’t involved in such things.